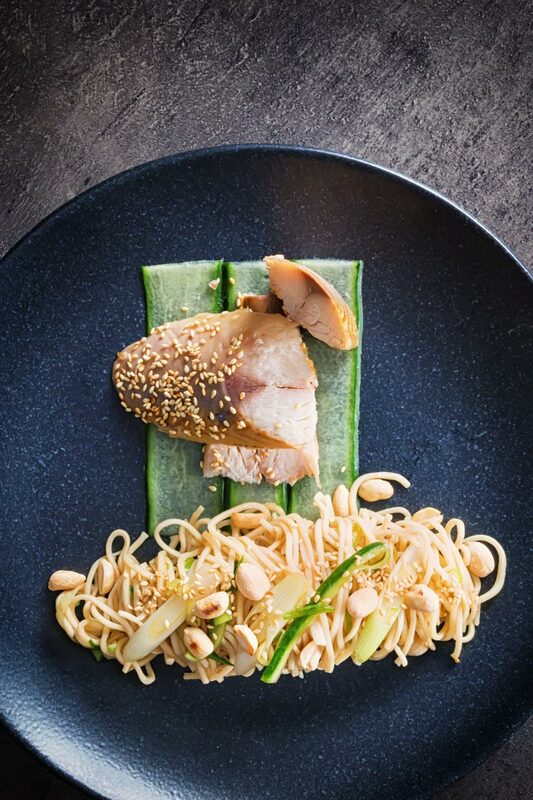 Smoked mackerel is one of my favourite ingredients and here it is joined by a glorious Asian noodle salad with ‘pickled’ cucumbers, crunchy nuts and sesame. 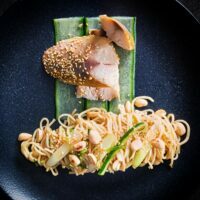 Asian Smoked Mackerel Noodle Salad. You all know me by now, if not why not? I am back plowing the populist furrow with this smoked mackerel noodle salad. Smoked mackerel is one of my favourite ingredients and my site is littered with smoked mackerel recipes. Everything from Kedgeree through to smoked mackerel pasta gets a look in. 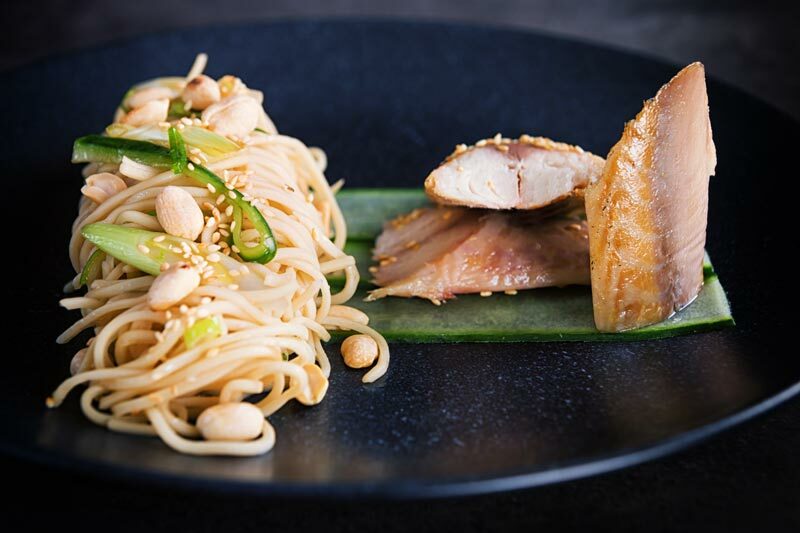 It is also a wonderful salad ingredient, and this Asian style noodle salad with smoked mackerel joins a smoked mackerel and apple salad and a smoked mackerel and mango salad. 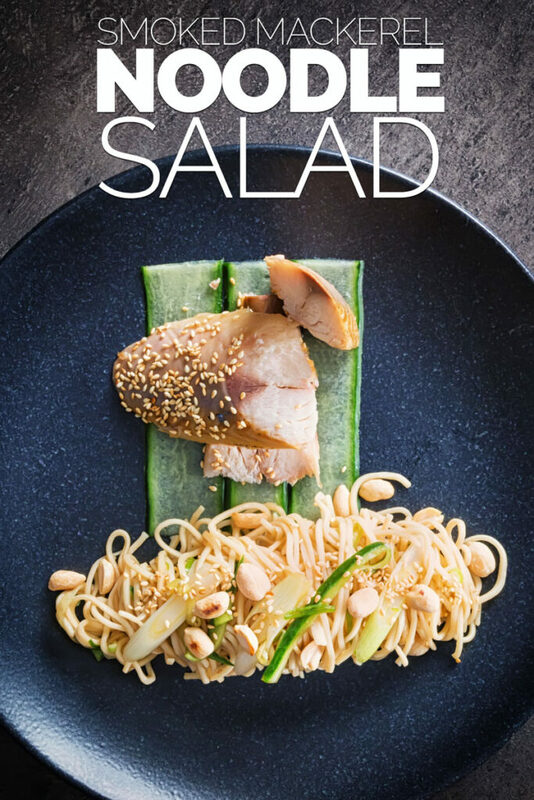 This recipe takes some very ‘British’ ingredients like smoked mackerel and fuses it with beautiful Asian flavours to form a quick salad recipe. We almost ‘quick pickle’ the cucumbers in soy, Chinkiang vinegar, and mirin. Then we bring it all together with some crunchy nuts and sesame in the form of both oil and seeds. I wish I saw smoked mackerel more often it has the most wonderful rich texture and flavour. It also costs pennies and is as far as I am concerned far more interesting to the much more expensive smoked salmon. The cucumbers and spring onions in this recipe are not really pickled in the traditional sense. They are steeped in a cold pickling liquid to keep them a little brighter and fresher. Using a little of this pickling liquid helps flavour the noodles and is stunning alongside a little roasted sesame oil. Just like my love of smoked mackerel you may have noticed I have a thing for pickles too! Everything from peaches to fennel gets a look in when it comes to a little bit of pickling. My love of pickles is definitely influenced by my time in Hungary… In the UK I was of course exposed to heavily pickled onions and even eggs, but the Hungarians excel at relatively light pickles. We get served them at practically every meal out and they are always my favourite part. 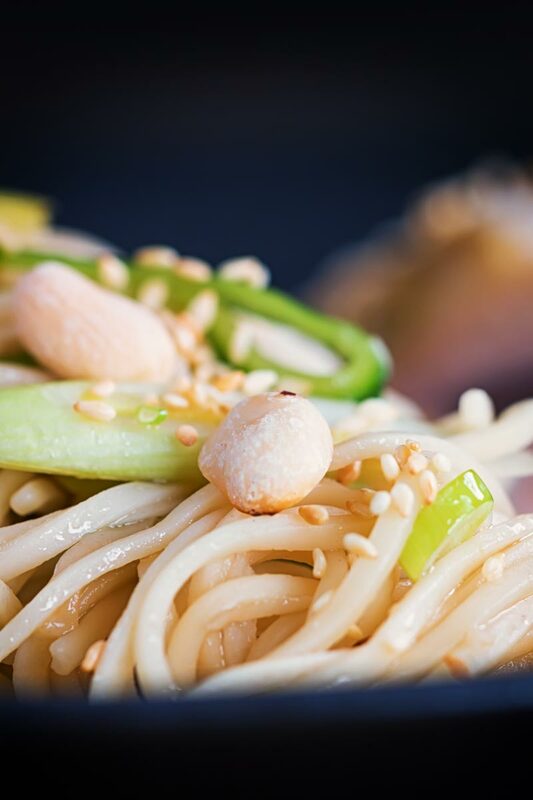 As a result they appear in some way in lots of my recipes, it is a wonderful technique and really shines in this cold noodle salad recipe. 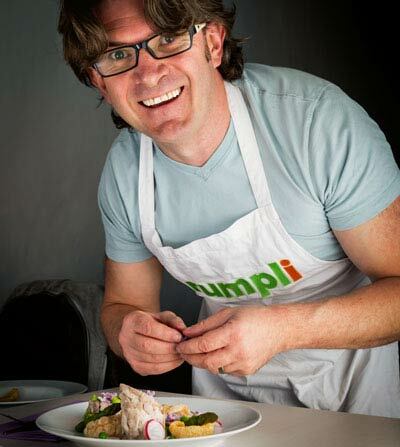 You can of course just chuck all of these ingredients in a bowl, grab a fork and munch away and it would be delightful. I do however love to play around with new plating or food styling ideas. It always makes a meal feel a little special when it has been carefully put on a plate. It really does not take very long and as a food blogger I’m not the sort of guy that decorates my table… Because I just don’t do that. Laying flowers or sprinkling ingredients on my table just feels silly. However, arranging food on a plate in an attractive way is something I try to do as often as possible. Whether I am pointing a camera at it or not. Begin by prepping the spring onions, remove the outer leaves, slice the white part obliquely and finely slice the remainder. Now move onto the cucumber, you want something about 30-35cm long. Cut off the edges and then cut it in half, take one half and using a vegetable peeler create ribbons of cucumber, discarding the seed part in the middle. Repeat with the second half. Set aside 6 of these ribbons and then shred the remainder into long strips. Mix together the soy sauce, mirin, vinegar, sugar, then add in the shredded cucumber and white parts of the spring onion and set aside. Cook your egg noodles as per the instructions on the packet and then refresh in cold water. When the noodles are cooked and refreshed remove the cucumber and spring onion from the pickling liquid and add to the noodles. Add a tablespoon of the pickling liquid and the sesame oil along with the sliced spring onion. Slice your mackerel fillets and get creative with the plating... You can, of course, chuck it all in a bowl and it will taste delicious! 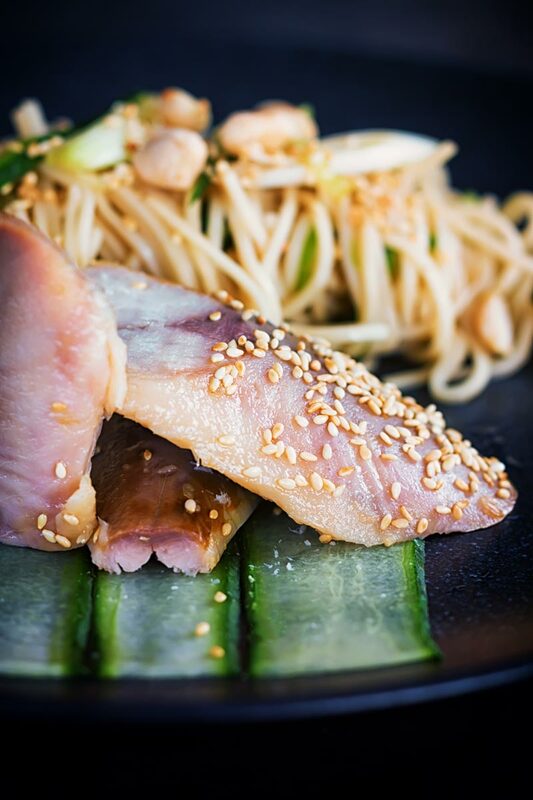 Smoked mackerel, peanuts, Chinkiang vinegar, sesame … my taste buds are doing back flips! The smoked fish sounds lovely paired with the Asian noodles. Can’t wait to try this combo! Than you so much, I don’t really think my food is particularly gourmet, mackerel, cucumber and noddles are really simple humble ingredients, I just like to play with presentation and make even the most humble of ingredients look and feel special 🙂 Smoked mackerel is heavenly so many big bold flavours and the oily nature of it makes it perfect for smoking! You’re killing me! At 13 weeks pregnant mackerel is one thing that I’m seriously missing so this recipe has just made my mouth water so much! It’s time to start a ‘recipes I’ll make when this baby pops out’ list I think! Absolutely gorgeous plating! I just love how you brought out that bright green color in the cucumbers. So beautiful!